Make grammar instruction simple with DLI! it’s necessary, but you want to preserve a focus on authentic writing? grammar programs can be overly time consuming? supplemental materials you find don’t fit together well? most resources don’t give ideas for direct instruction; they provide only review or practice items and assume the skill has been previously taught? achieving carryover requires consistent review as well as teaching skills? measurable growth is important in your world, but most resources do not offer meaningful assessments? DLI was created by two teachers who shared your frustrations. They were committed to knitting together ALL of the elements of the instructional cycle into ONE cohesive resource to support your instruction from start to finish. It was critical that DLI be focused and begin with direct skill instruction. Quick, daily practice tasks, embedded review, and weekly assessments completed the instructional cycle. These teacher and student-friendly materials have been helping teachers, homeschool parents, and tutors since 2002. Imagine how good it will feel to build a strong foundation in writing conventions with just a few minutes a day and the support of DLI. DLI focuses on one new skill each week. Beginning the first week of the school year, you begin to build a strong foundation avoiding gaps or duplication in instruction. Teaching all of the skills in your district and state standards including the Common Core State Standards by the end of the school year can seem like an impossible task. DLI makes it possible…just one week at a time! 1. Kick off the week with a mini-lesson to introduce the new focus skill. DLI includes strategies to support your lesson. 2. Use the short, daily, reproducible tasks to build new skills and review previous skills. 3. The weekly assessment mirrors the formats found in formal assessments. DLI is quick and effective. Plan 5-10 minutes a day to complete the daily practice Monday-Thursday. Since DLI is reproducible, you do not lose valuable class time while students copy practice items. On Friday, the weekly assessment and mini-lesson for the new focus skill require 30-45 minutes. Click on Week at a Glance to see a weekly plan. 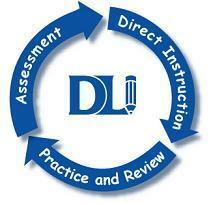 DLI supports every step of the learning cycle, unlike other resources that provide only review items. Direct instruction, in the form of a mini-lesson, forms the foundation for your work on the new skill. Count on DLI to provide strategies for your lesson! Next, use the short, daily, reproducible tasks to create opportunities for practice and review. The instructional cycle continues with a weekly assessment. DLI knits all of the elements of the learning cycle together into one cohesive resource. How does DLI compare to other English Language Arts resources? Click here for a Comparison of DLI and Other English Language Arts resources. Weekly assessments prove beneficial for both teachers and students. They provide an opportunity for you to monitor your students’ progress and provide early intervention. For students, frequent short assessments create an opportunity to hone their test-taking skills. Since the assessments employ formats found in other formal assessments, students make a smoother transition to demonstrating mastery. As the year progresses, students encounter a wider variety of items on weekly assessments and also build their skills in following directions. DLI is a perfect way to start the day. Students are ready to discuss the practice items by the time you have completed attendance, lunch count, and morning announcements. Students like DLI and gain confidence with the support of a spiraling review. Expect to see a lot of hands raised when you discuss the daily tasks! Since DLI is reproducible, students can complete it quickly with no tedious copying from the board. DLI plays a vital role in supporting your writing conferences. As the year progresses, you will find that students bring more background to their conferences as a result of their work with DLI. The five to ten minutes you spend each day on DLI is a great investment in providing a scaffold for their time in conference with you or an effective follow-up. They may meet a new skill in the context of a conference with you, which may be later reinforced by DLI. Or DLI can provide the first exposure, which will be applied in a conference; the combination is effective. Consistent use of DLI results in a deeply-rooted skill base that carries over to every day writing. DLI proves to be an effective tool for increasing student achievement. You will find no smoke and mirrors with DLI. It works because it is simply good instruction. Evidence of student growth is supported by this district data sample. Click here to view the data sample for Summit County School District. Pre-post assessments provide valuable tools to support your instruction. While a spiraling review is built into the DLI materials, the pre-post assessments will easily allow you to identify areas where more support may be needed and to celebrate growth with your students. 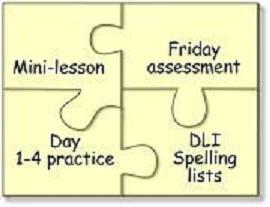 Several of the weekly skills in the DLI materials could also be considered spelling skills. Some examples include contractions, plurals, singular possessive nouns, and homophones. By using the optional spelling lists included in the DLI book, your students can benefit from a two-pronged approach. Since the weekly DLI skill and the spelling skill correlate with one another, instruction in both areas becomes more effective. 30 weeks of spelling lists, which parallel the weekly skills when possible, as well as a diagnostic test are included in the book. Capitalization, punctuation, grammar, and usage have been given increased emphasis with the adoption of the Common Core State Standards. However, educators are finding that relying on their districts' reading series or use of commercial review resources lacks adequate support for true skill development for writing conventions. Daily Language Instruction solves this problem: DLI is an effective stand-alone supplementary resource that provides comprehensive skill development for writing conventions and features direct instruction on a weekly focus skill, quick daily practice, spiraling review, and assessment. A revision of the DLI materials for grades 1-6 ensures that they provide strong support for the increased rigor in your district and state standards including the Common Core State Standards. Click the Products tab and the appropriate grade level to lead you to documents that provide detailed information about the skills that were added as well as a CCSS correlation for each grade level. Additionally, you may wish to access and download the entire DLI 1-6 Scope and Sequence by clicking on this link. Daily Language Instruction was developed as a result of empirical evidence gained by decades of experience in the field, and it was informed by current research. Learn about the development of DLI and its authors and editors by clicking on the links below and downloading the following documents.